How do Scientists Know What They Know? Jean Pennycook www.penguinscience.com. 2 How do Scientists Know What They Know? Our society relies on Scientists to unlock the mysteries of the world. From plate tectonics, to cells, to how the Universe works, generations of men and women have spent their lives searching for the patterns of life and the rhythm of the Earths systems. Animal Biologists work to understand how other species live. Since we can not talk to the other animals, to learn about their lives requires carefully planned experiments. 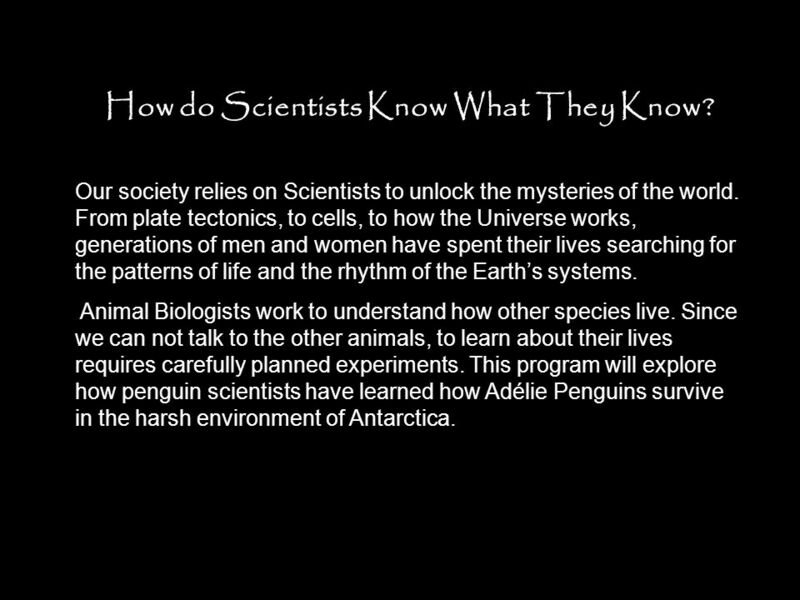 This program will explore how penguin scientists have learned how Adélie Penguins survive in the harsh environment of Antarctica. 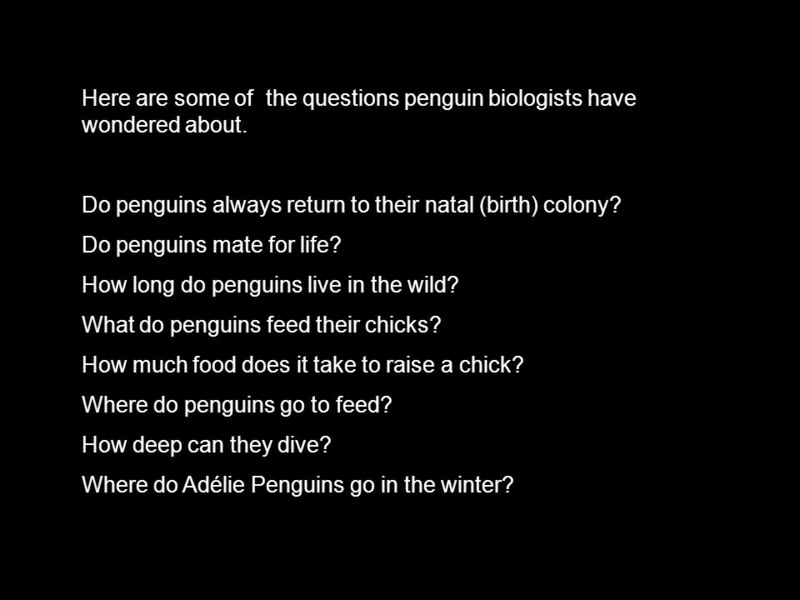 4 Here are some of the questions penguin biologists have wondered about. Do penguins always return to their natal (birth) colony? 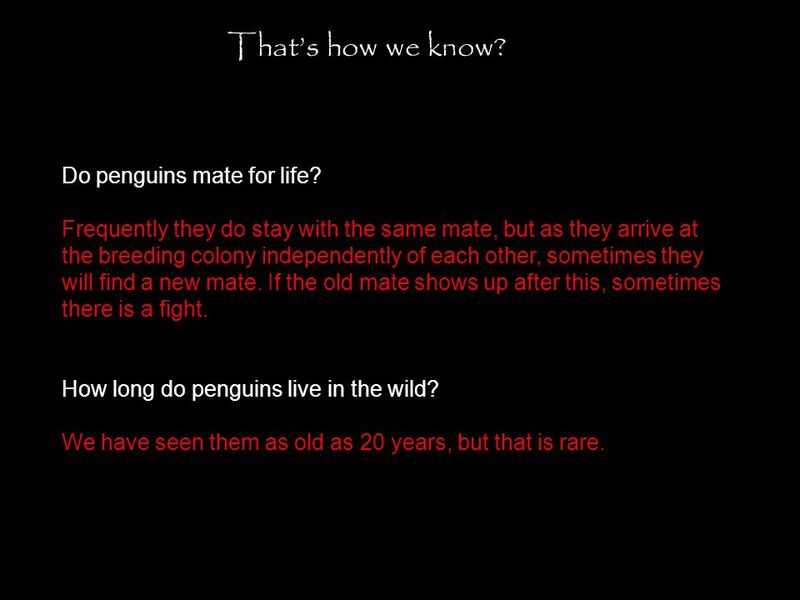 Do penguins mate for life? How long do penguins live in the wild? What do penguins feed their chicks? How much food does it take to raise a chick? Where do penguins go to feed? How deep can they dive? 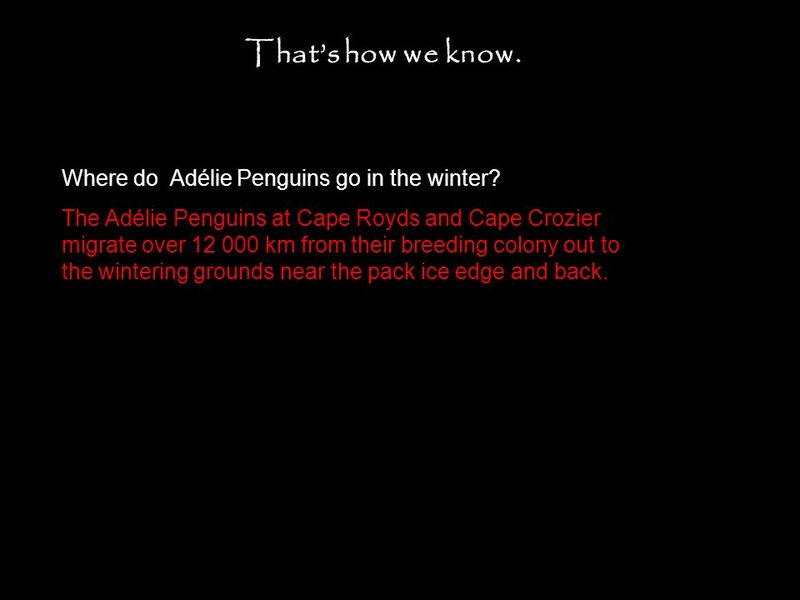 Where do Adélie Penguins go in the winter? 5 Do penguins always return to their natal (birth) colony? Do penguins mate for life? How long do penguins live in the wild? How do we know? This is a penguin flipper band. 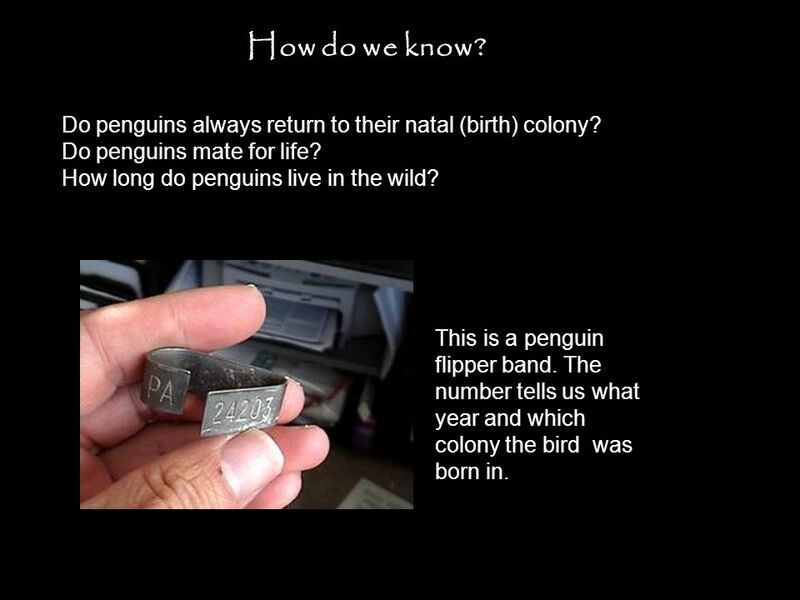 The number tells us what year and which colony the bird was born in. 6 When the chicks are big enough and ready to be banded we catch them in a corral. 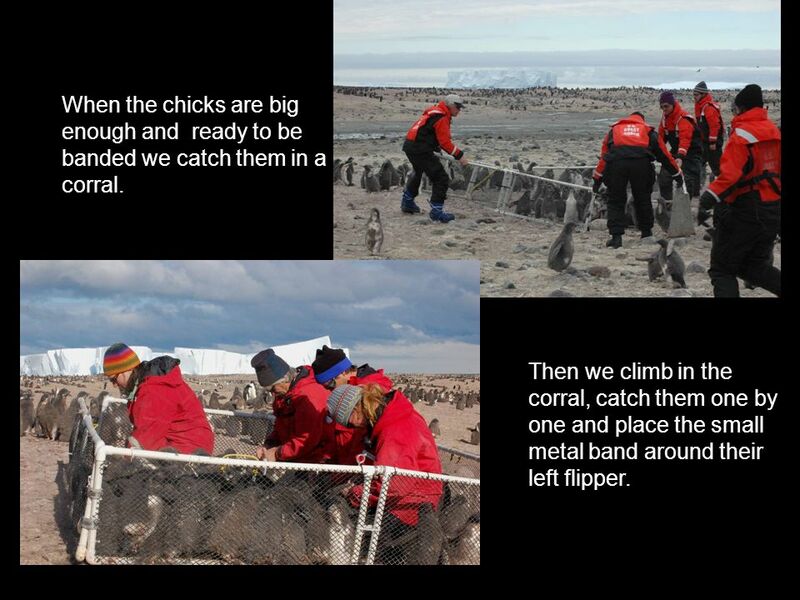 Then we climb in the corral, catch them one by one and place the small metal band around their left flipper. 7 Putting the band on a chick A banded adult bird Banding does not interfere with the birds ability to swim or find food. It may take 2-4 years before we see the bird after banding it, as Adélie Penguins do not reach breeding maturity until then. 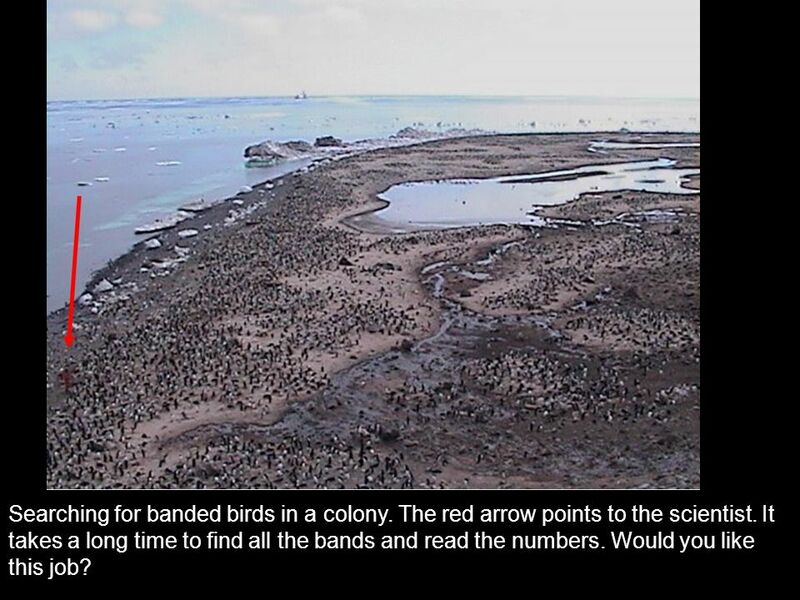 8 Searching for banded birds in a colony. The red arrow points to the scientist. It takes a long time to find all the bands and read the numbers. Would you like this job? 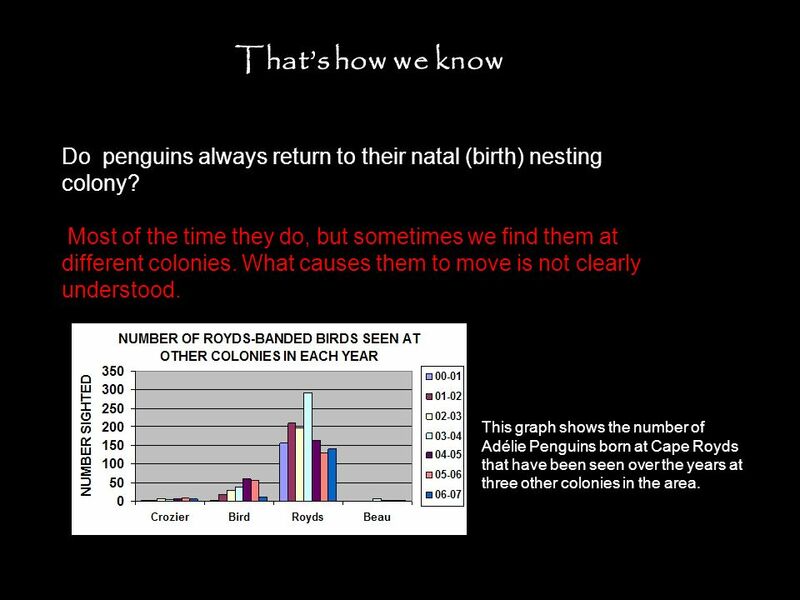 9 Thats how we know Do penguins always return to their natal (birth) nesting colony? Most of the time they do, but sometimes we find them at different colonies. What causes them to move is not clearly understood. This graph shows the number of Adélie Penguins born at Cape Royds that have been seen over the years at three other colonies in the area. 10 Do penguins mate for life? Frequently they do stay with the same mate, but as they arrive at the breeding colony independently of each other, sometimes they will find a new mate. If the old mate shows up after this, sometimes there is a fight. How long do penguins live in the wild? We have seen them as old as 20 years, but that is rare. Thats how we know? 11 How do we know? What do the penguins feed their chicks? Orange means krillSilver means fish We sit and wait for a returning parent to feed their chicks and then record the color of the food. This is called data by direct observation. We record our observations in a field journal every day. 12 Thats how we know. What do the penguins feed the chicks? Sometimes krill and sometimes fish, But what kind of fish? 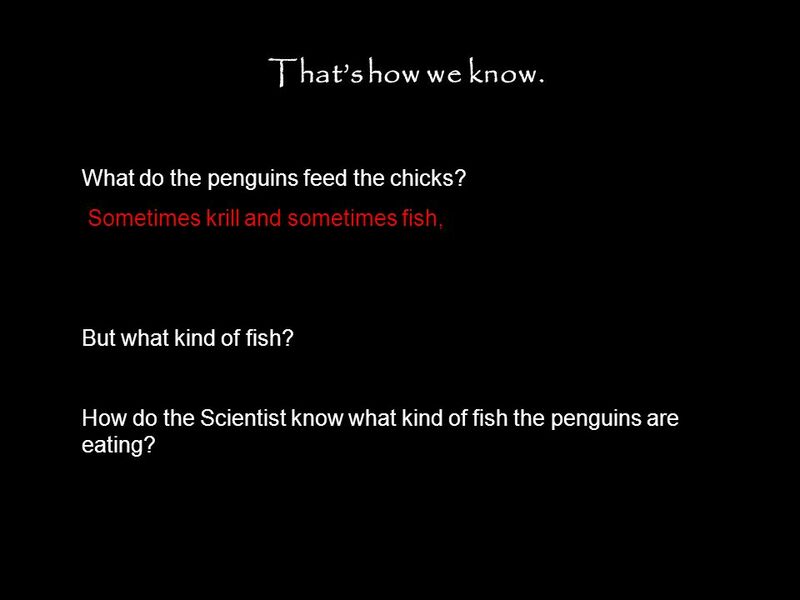 How do the Scientist know what kind of fish the penguins are eating? 13 Otoliths are fish ear bones. 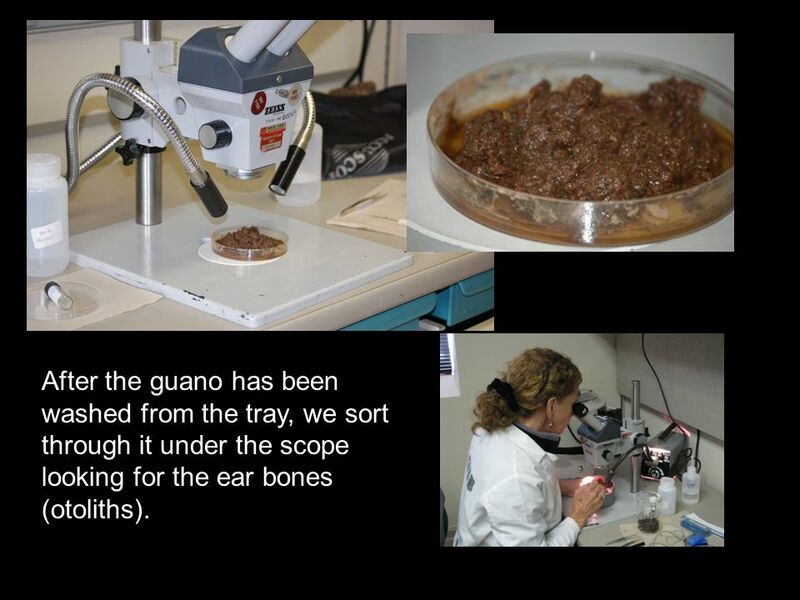 They are not digested and pass through the penguins into the guano (poop). We gather the guano and examine it under the stereoscope. Otolith tray set out at the beginning of the season. 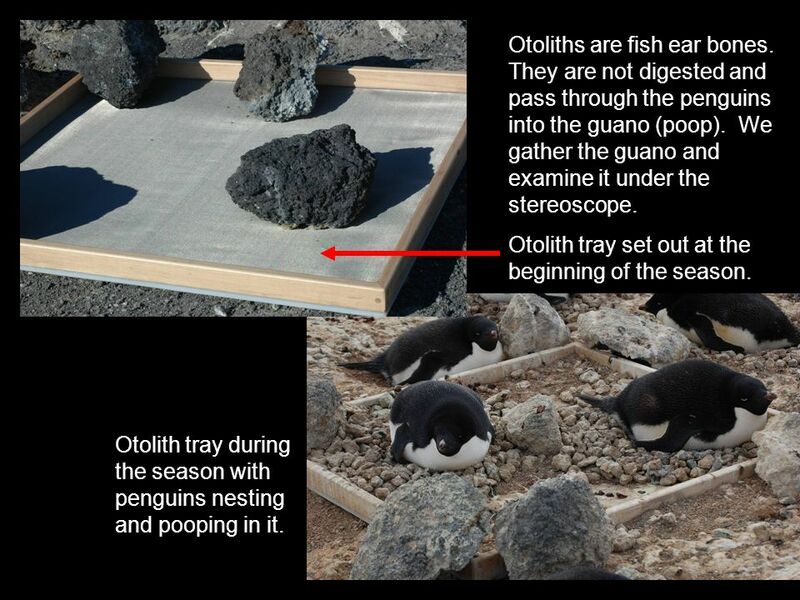 Otolith tray during the season with penguins nesting and pooping in it. 14 After the guano has been washed from the tray, we sort through it under the scope looking for the ear bones (otoliths). 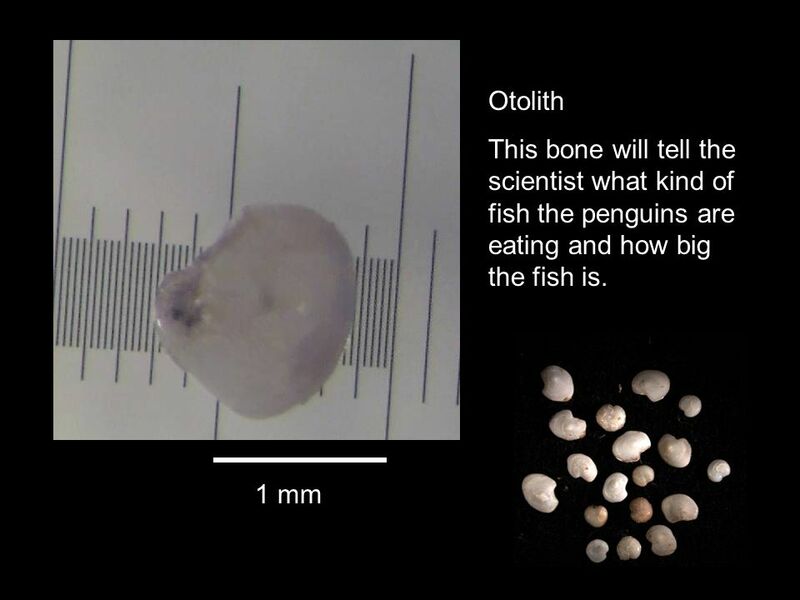 15 1 mm Otolith This bone will tell the scientist what kind of fish the penguins are eating and how big the fish is. 16 How much food does it take to raise a chick? How do we know? Penguins are tagged that belong to the breeding colony inside the fence. Only way to go in or out is over the weighbridge (the arrow points to the weighbridge). The computer inside the tent records the information. 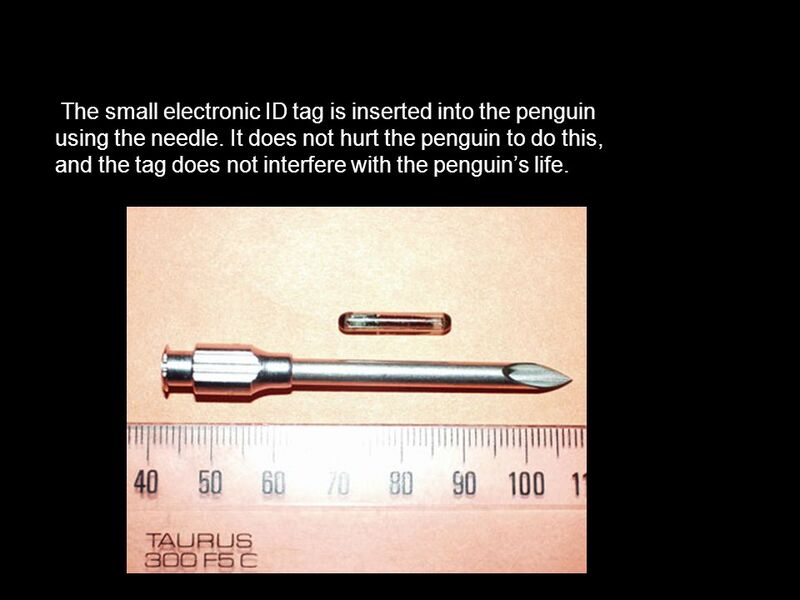 17 The small electronic ID tag is inserted into the penguin using the needle. 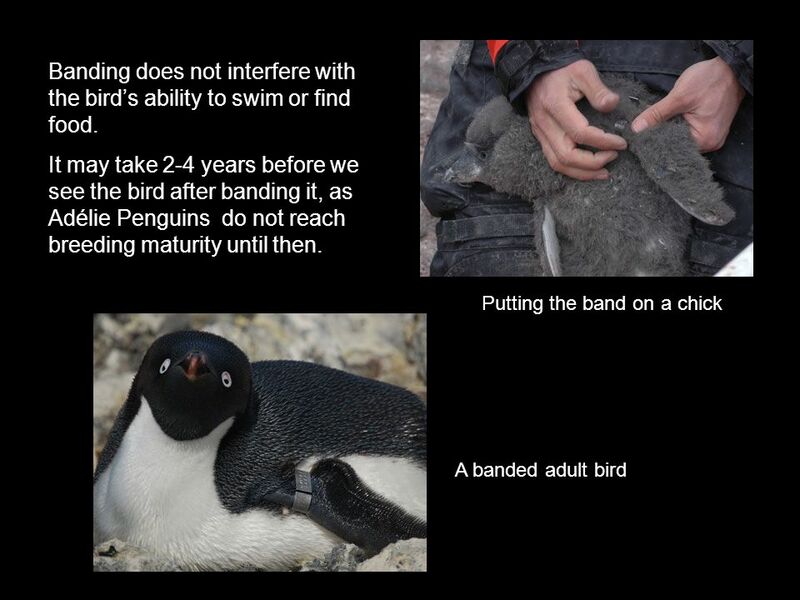 It does not hurt the penguin to do this, and the tag does not interfere with the penguins life. 18 The hoop records the tag number of the penguin as it comes and goes from the colony. 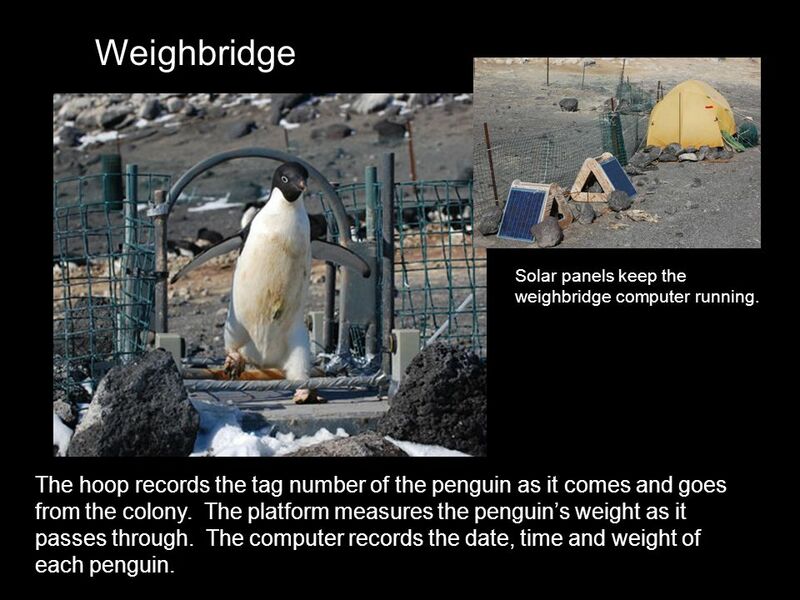 The platform measures the penguins weight as it passes through. 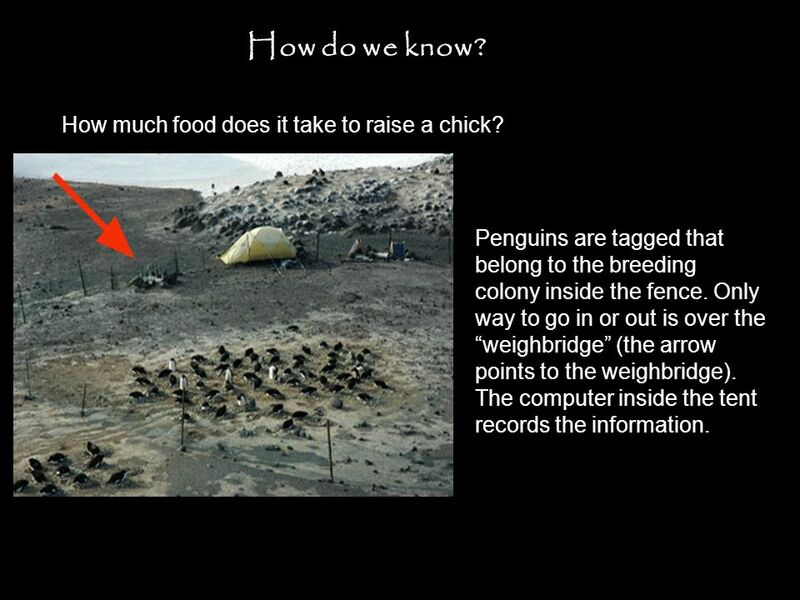 The computer records the date, time and weight of each penguin. Weighbridge Solar panels keep the weighbridge computer running. 19 Thats how we know. How much food does it take to raise a chick? 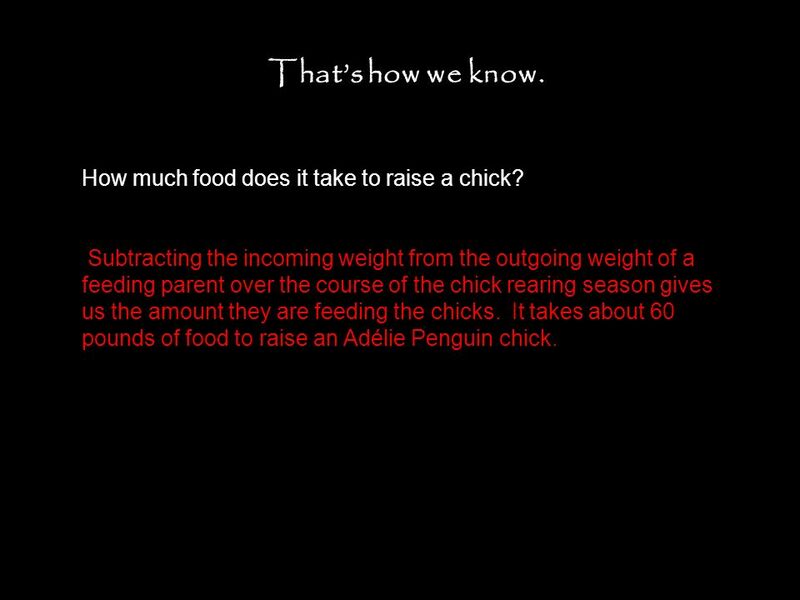 Subtracting the incoming weight from the outgoing weight of a feeding parent over the course of the chick rearing season gives us the amount they are feeding the chicks. It takes about 60 pounds of food to raise an Adélie Penguin chick. 20 How do we know? Where do penguins go to feed? 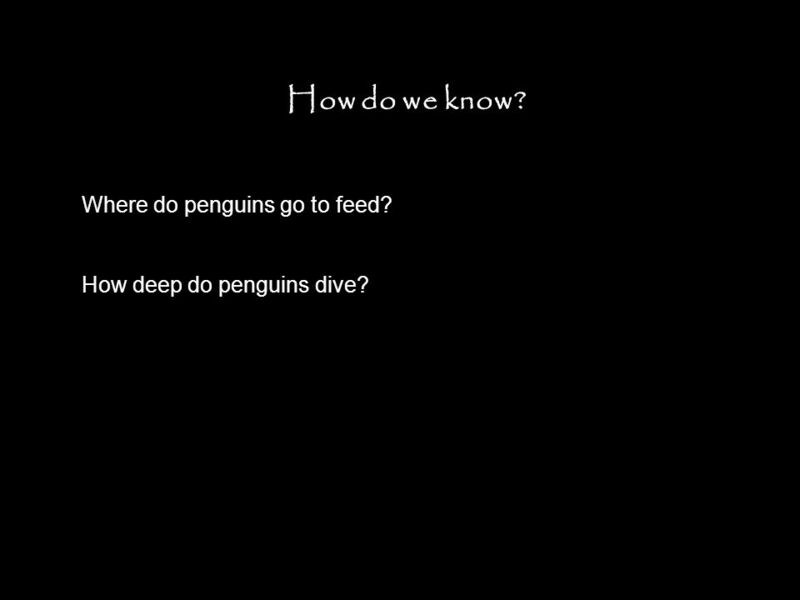 How deep do penguins dive? 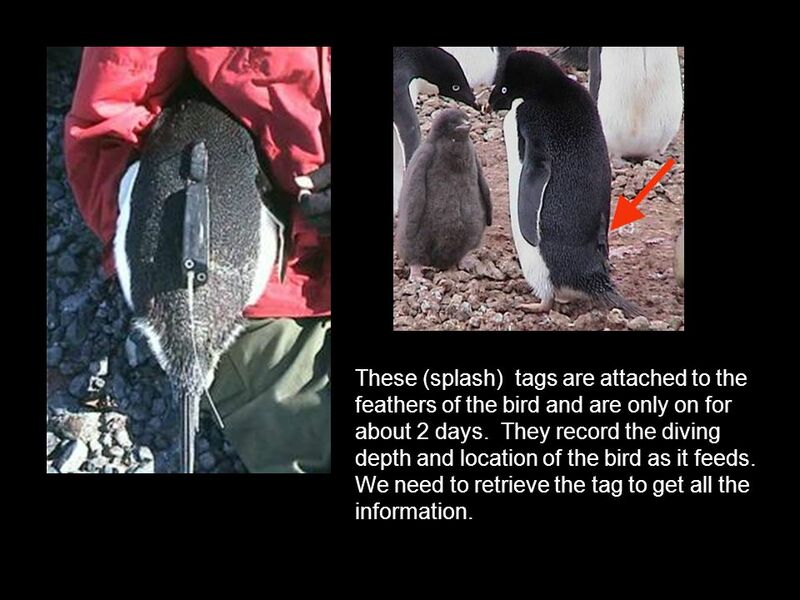 21 These (splash) tags are attached to the feathers of the bird and are only on for about 2 days. They record the diving depth and location of the bird as it feeds. We need to retrieve the tag to get all the information. 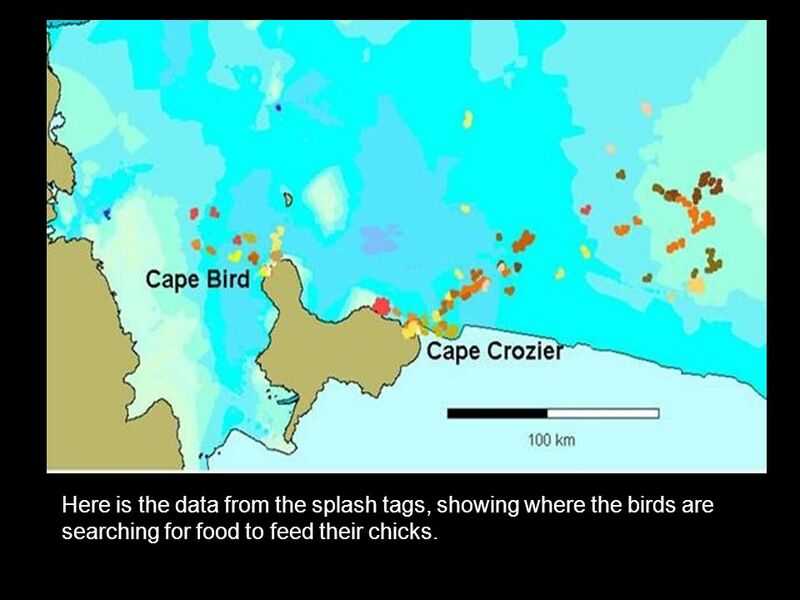 22 Here is the data from the splash tags, showing where the birds are searching for food to feed their chicks. 23 Where do Adélie Penguins go to feed? 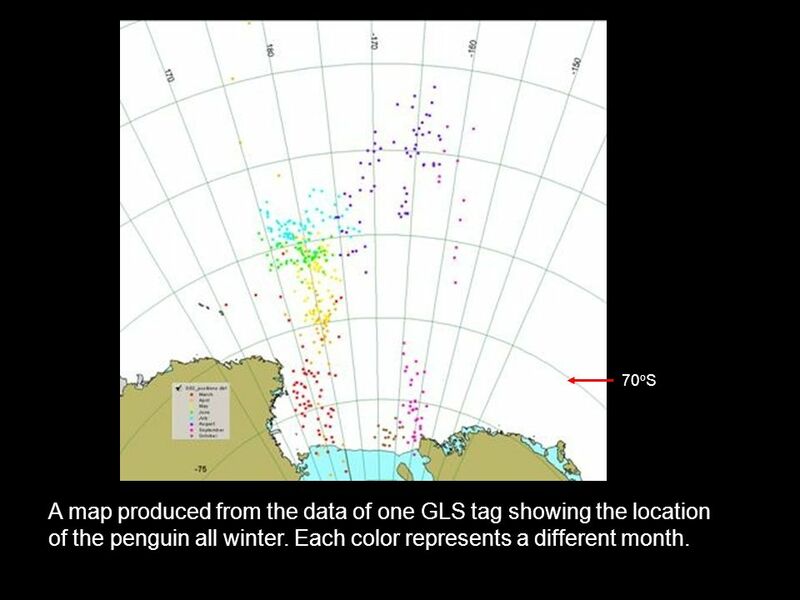 See the map showing where penguins from two different colonies were tracked. 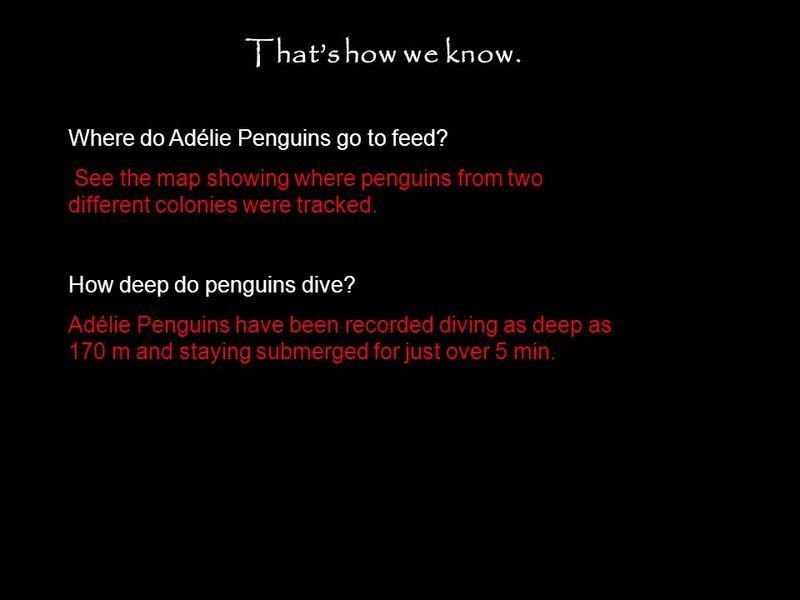 How deep do penguins dive? Adélie Penguins have been recorded diving as deep as 170 m and staying submerged for just over 5 min. Thats how we know. 24 How do we know? 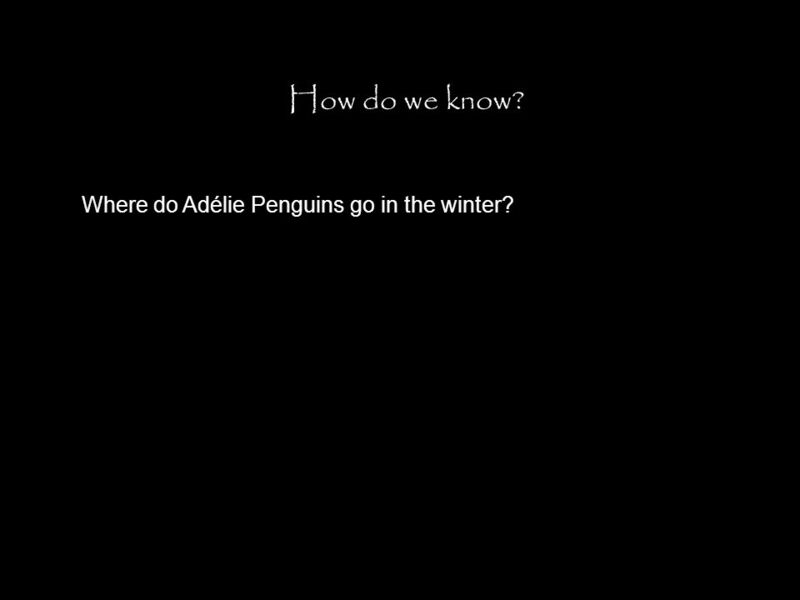 Where do Adélie Penguins go in the winter? 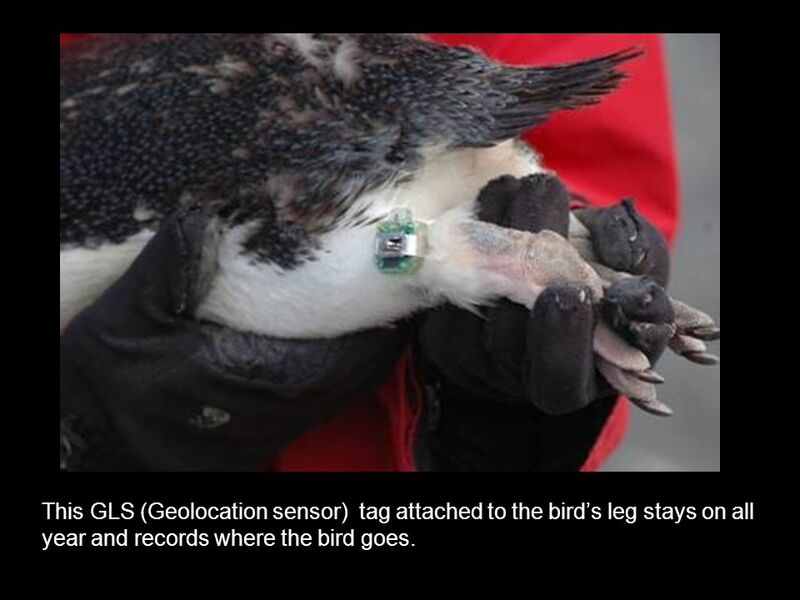 25 This GLS (Geolocation sensor) tag attached to the birds leg stays on all year and records where the bird goes. 27 Where do Adélie Penguins go in the winter? 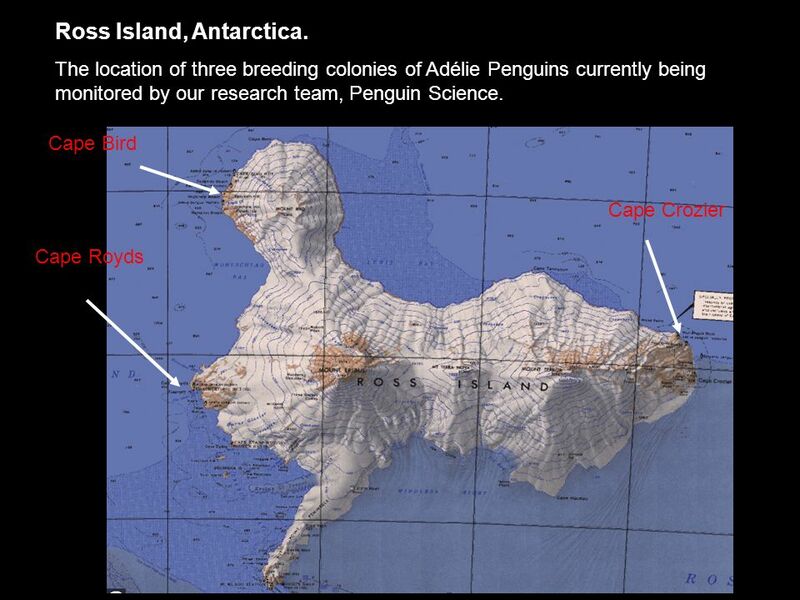 The Adélie Penguins at Cape Royds and Cape Crozier migrate over 12 000 km from their breeding colony out to the wintering grounds near the pack ice edge and back. Thats how we know. 28 There are still many unanswered questions about Adélie Penguins, as well as all the other plants and animals of the world. If being a Biologist sounds like fun, you are right, it is. 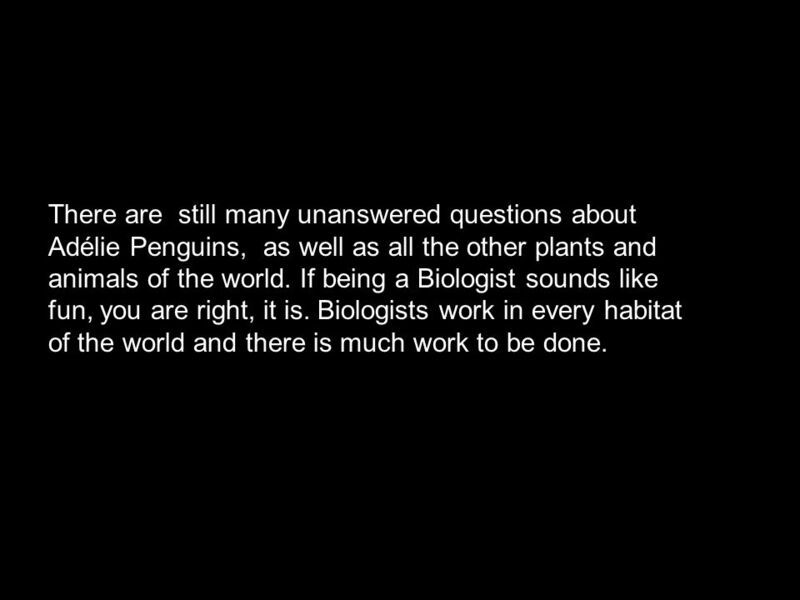 Biologists work in every habitat of the world and there is much work to be done. 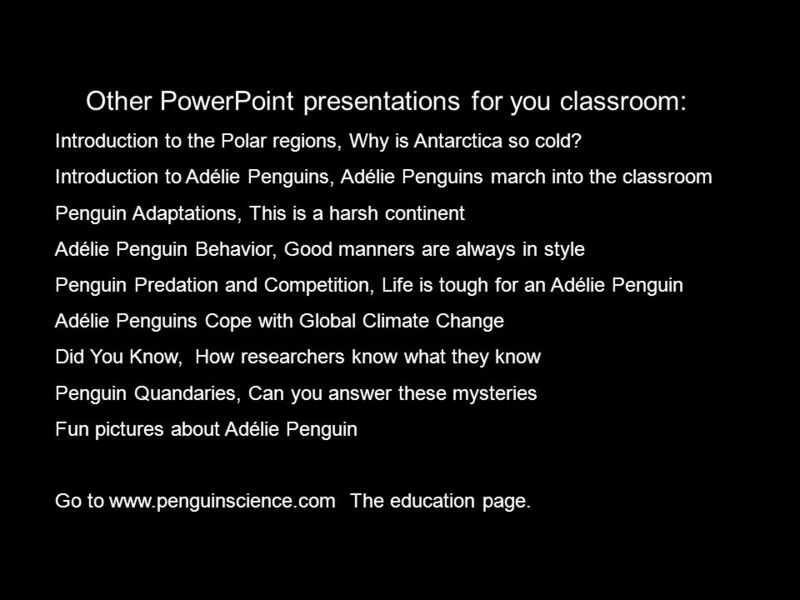 29 Other PowerPoint presentations for you classroom: Introduction to the Polar regions, Why is Antarctica so cold? 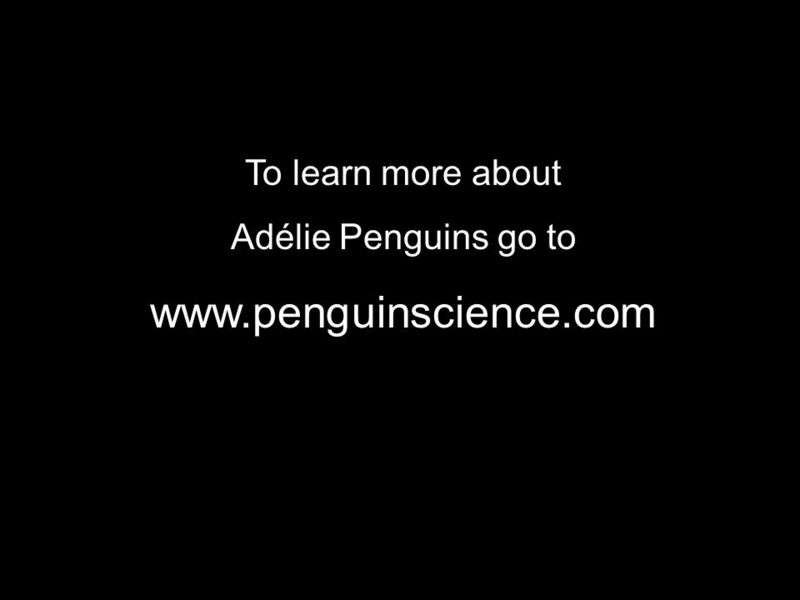 Introduction to Adélie Penguins, Adélie Penguins march into the classroom Penguin Adaptations, This is a harsh continent Adélie Penguin Behavior, Good manners are always in style Penguin Predation and Competition, Life is tough for an Adélie Penguin Adélie Penguins Cope with Global Climate Change Did You Know, How researchers know what they know Penguin Quandaries, Can you answer these mysteries Fun pictures about Adélie Penguin Go to www.penguinscience.com The education page. 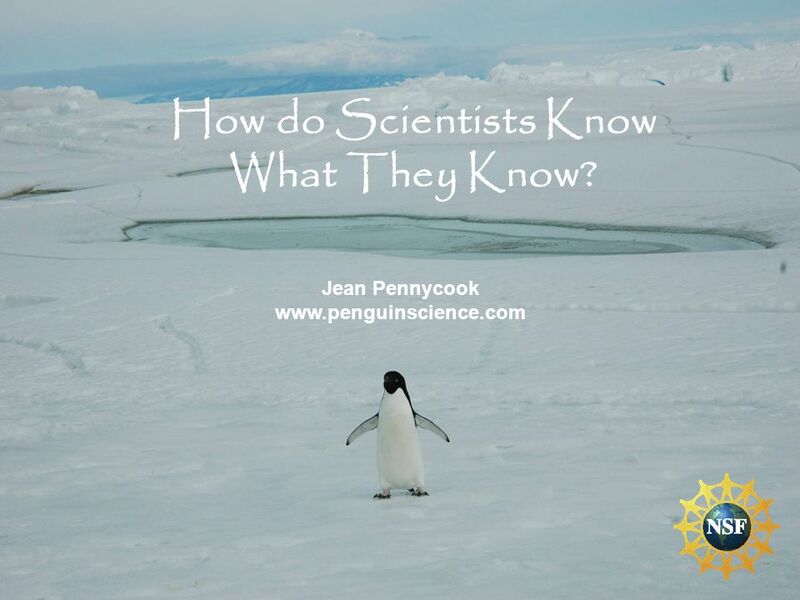 Download ppt "How do Scientists Know What They Know? Jean Pennycook www.penguinscience.com." List at least 3 adaptations that makes it possible for the animal to survive in a cold climate? Fur/hair Blubber Ability to hibernate or migrate. Research Question: Would a penguin make a good pet in my home? Presentation by: Mrs. Merrill. FACTS Height: 28 inches Weight: 8 to 14 pounds Diet:Mostly krill (tiny shrimp-like animals. Habitat: In the Antarctic peninsula. Emperor Penguins Cindy Tang Jonathan Wang Jonathan Wang Jonathan Chen Jonathan Chen Shyla Logan Shyla Logan Learning Team #6 Period 3, Life Science Miss. Chinstrap Penguins By Matthew Grayton and Emily Duckett Contents. Jean Pennycook Fun Penguin Pictures. PENGUINS By Christie Black. Chilly Willy’s Story. Let’s Learn About Penguins BY: AMBER WILBURN. Penguins are Birds They cannot fly. TheyThey have black and white feathers. TheirTheir bodies are like torpedoes. 1 Jean Pennycook penguinscience.com Introduction to Adelie Penguins. Penguins By Kyla Conner. Objectives You will identify the life cycle of a penguin. 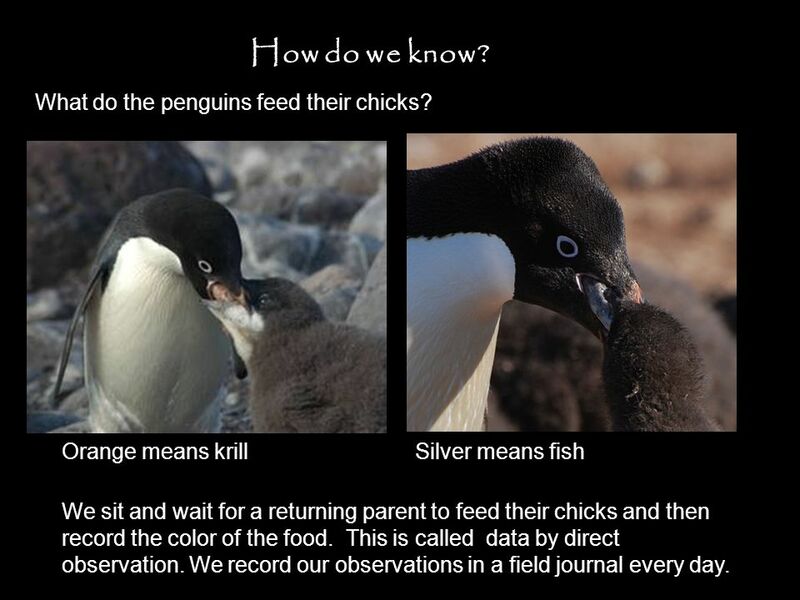 You will identify the life cycle of a penguin. You will be able to. Penguins on Parade Penguins are birds that cannot fly. Their bones are heavy and their flippers are thin. They love to eat fish, squid, and krill. Power Point by Stephen. Introdution Speedy little blurs flying throgh the water they are penguins but penguins don’t fly they waddle and when babys are. Penguins By dawsoncenter. Structural adaptation One structural adaptation for the penguin is that they have water proof feathers. If they didn’t have. Penguins Mrs. Budde & Ms. Enger’s 2nd Grade Class 2004. There are 17 species, or kinds, of penguin. Four species, the Adelie, the Emperor, the Chinstrap and the Gentoo, breed in Antarctica. Several other.